Delta's Dark Den of Destruction: Mudah.com.my - Malaysia's Newest Internet Marketplace! Mudah.com.my - Malaysia's Newest Internet Marketplace! Organising an internet marketplace is never an easy task, but with the entry of Mudah.com.my, it looks like it's going to give other established local auction sites a good run for their money. It's pretty clear enough, one of Mudah's biggest advantages compared to its competitors is its pure simplicity in design. 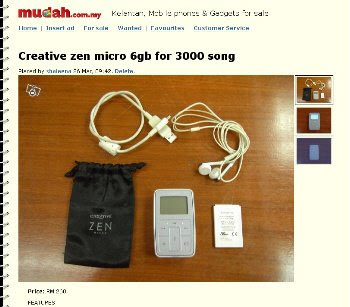 Unlike one particular local auction website, Mudah currently has no flashy and distracting ads on their website. In fact, their only ads are the ones that the customers precisely want to see. This review is brought to you by Advertlets.com and Mudah.com.my! Mongolia To Sever Diplomatic Ties With Malaysia? Lee Kah Choon Quits Gerakan! Election Day Mystery Still Unsolved?